Manchester United manager Jose Mourinho is reportedly happy about Anthony Martial being offered a new contract at Old Trafford. This is according to the Daily Mirror, and comes as something of a shock given all that has gone on between the manager and the player in the last few months. Martial has rarely been a regular starter under Mourinho, despite being long regarded as one of the most promising young players in Europe and becoming a real fan-favourite at United. The France international was left out of the United squad for the 3-0 defeat to Tottenham on Monday despite not being injured, with the player bemused at this snub and looking to quit the club, according to RMC‘s report at the time. 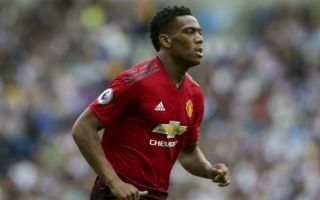 Since then, however, the Times have claimed Martial is ready to extend his stay with the Red Devils as he feels he could be at the club longer than Mourinho after this poor start to the 2018/19 season. Which of Man Utd's six candidates would be YOUR pick to replace Mourinho? No one - keep Mourinho! And while CaughtOffside have been told this decision may be due to Zinedine Zidane’s encouragement as he expects the chance to replace Mourinho imminently, the Mirror state Mourinho is happy with this decision taken by the club. The Daily Mail claim the Portuguese could face the sack if United lose their next league game against Burnley, so perhaps he has bigger things to worry about than Martial anyway. United fans will certainly be pleased if the 22-year-old stays at the club, though something clearly needs to change if he is to fill his enormous potential.